These scones were something I made for myself. I figured vegetables in a not-overly-sweet pastry would be a hard sell, but as soon as these came out of the oven, the kids were BEGGING for them. They requested them for snack twice that day, and were thoroughly bummed when I informed them they weren’t allowed to have them again for dinner. To be fair, they really are delicious. The buttery, flaky layers here are so on point! 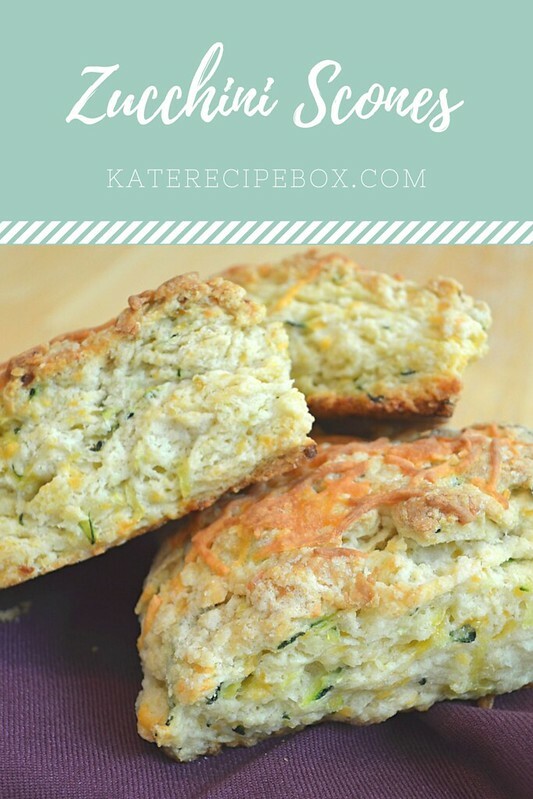 There’s just enough sweetness in these to make them perfect, but not overly sweet, and they’re a great way to use up some of that zucchini that I know you have hanging around! Preheat the oven to 400 degrees. Line a baking pan with parchment. In a large bowl, whisk together 2 1/2 cups flour, salt, baking powder, baking soda, and sugar. Cut in the butter until it forms a course meal. In a smaller bowl, combine the egg and sour cream. Pour into the dry ingredients and mix until just combined. 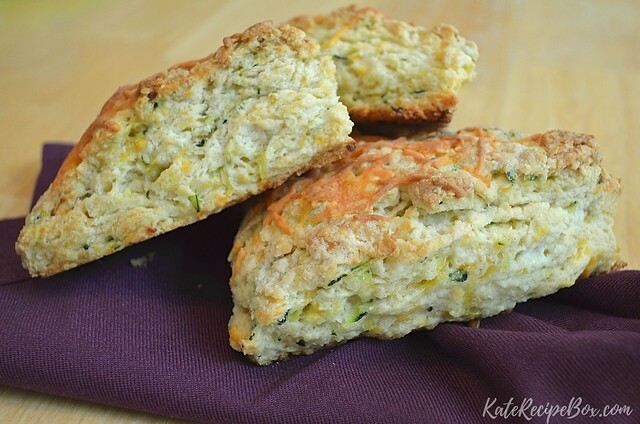 Fold in the zucchini and 1/2 cup cheese. Turn the dough out onto a floured board and work it into a round loaf shape. Using a pizza cutter or sharp knife, cut like a pie into 8 wedges. Carefully transfer the wedges to the prepared baking sheet. Sprinkle the tops with remaining cheese. Looking for more farm fresh inspiration? 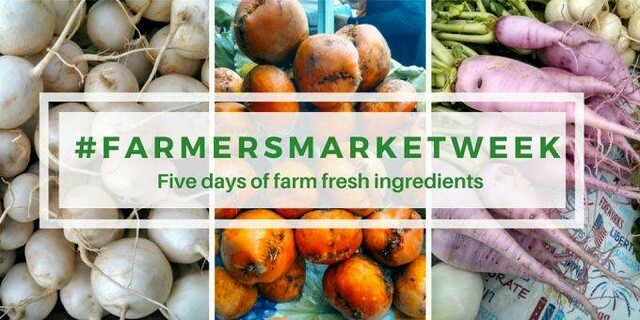 Here’s what other bloggers have cooked up for you today as part of #farmersmarketweek! Julie’s now 7 weeks old and I’m just getting into enough of a rhythm with the kids that I can actually stand over the stove and cook some nights. Up until this point, dinner has been something I can throw in the crockpot or oven between diaper changes. It’s been nice to do some hands-on cooking for a change! Still, dinners haven’t been anything too involved – this easy, one-pan meal was a recent favorite. I added a loaf of crusty bed and dinner was on the table in a half hour. Mom win! In a large skillet, melt 2 Tbsp. butter over medium heat. In the microwave, melt 4 Tbsp. butter in a shallow bowl. In another shallow bowl, whisk together the bread crumbs, 1/2 cup parmesan and flour. Coat the chicken in the butter then in the bread crumb mixture and add to the skillet. Cook for 3-4 minutes per side, until chicken is cooked through and the breading is golden. Remove chicken to a plate and tent with foil to keep warm. Add the remaining butter to the skillet. When melted, add the garlic and cook for 1 minute, until fragrant. 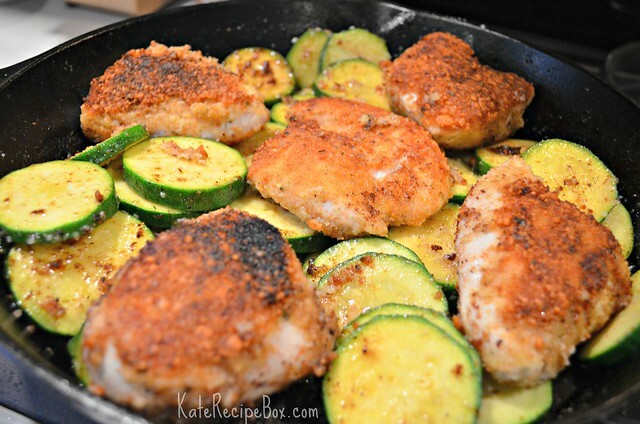 Add in the zucchini and cook until tender. Sprinkle with remaining parmesan. Add the chicken back and cook until heated through. Current craving: all the veggies. I’ve eaten more salad and grilled vegetable sandwiches recently than I ever have in my life. I’m not sure if it’s a pregnancy thing or just the mid-summer bounty, but it’s been delicious. While aimlessly flipping through Pinterest, this recipe caught my eye because of all of the veggies. I adapted it slightly to fit what we had in the garden/what looked best at the store, but you could really do this dish at any time of the year with whatever produce is in season. I served it along with a loaf of warm, crusty bread – it was an awesome summer dinner. Whisk together olive oil, balsamic vinegar, lime juice, garlic, salt and pepper. 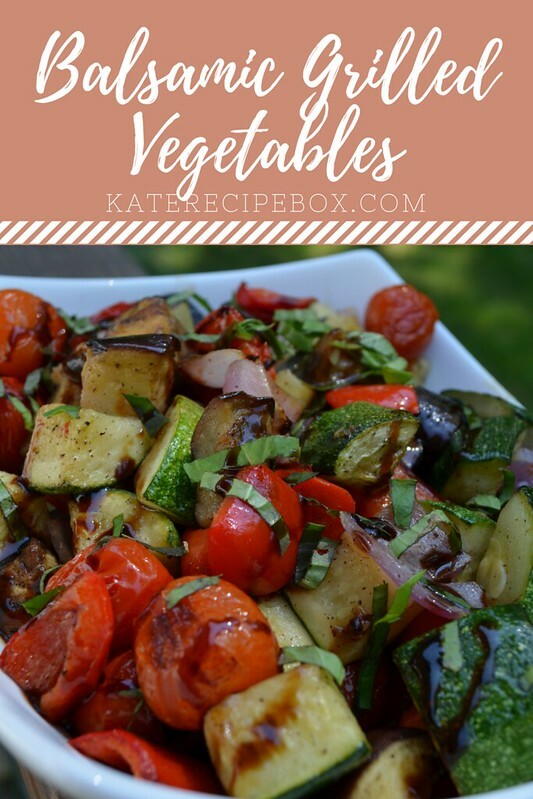 Toss all the veggies with the balsamic mixture and let sit for 30 minutes, stirring halfway. 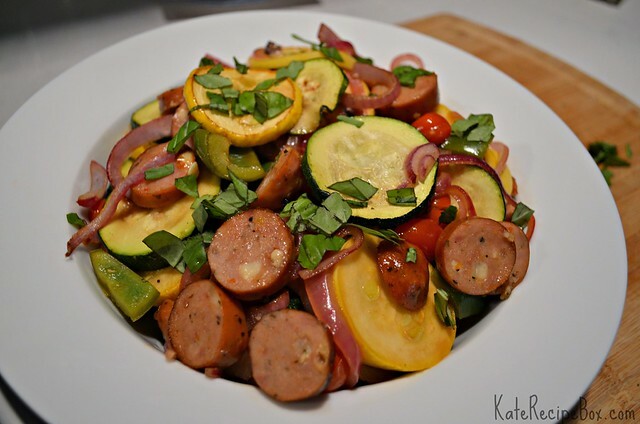 Stir the chicken sausage into the veggies and transfer to a sheet pan. Broil for 10-15 minutes, until vegetables are soft, turning halfway. Every once in a while, we end up with a really healthy week of dinner plans. I don’t usually do it consciously – it seems that after a week of celebrating or heavy eating, I naturally go for something lighter. And, really healthy meals are always a bit of a gamble around here. Something drowning in cheese and butter? Sure to be a hit. Something naturally gluten free and heavy on the veggies? Maybe – or maybe not. Luckily, this was a huge hit. 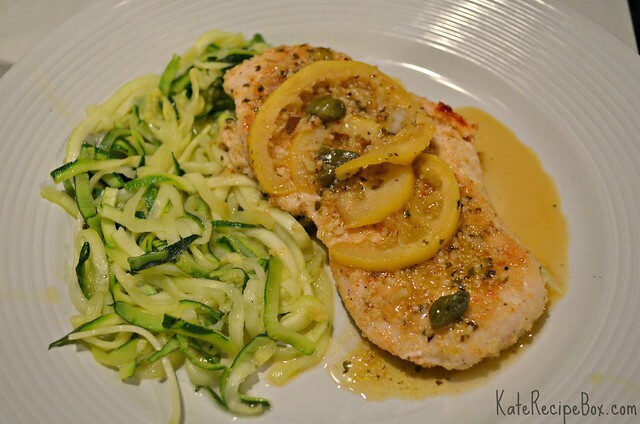 Zoodles as a side dish were great and the chicken was super easy but super flavorful. I was really impressed on how quickly this meal came together – and how satisfying it was. Whisk together the almond flour, salt and pepper in a shallow bowl and add chicken, one at a time, turning until thoroughly coated. Cut half of the lemon into slices and juice the other half. Heat 1 Tbsp. olive oil in a large skillet until shimmering. Add the chicken and cook for 2-3 minutes per side, until cooked through. Remove to a plate and cover with foil. Add garlic to the pan and cook until fragrant, about 1 minute. Add in the chicken broth and lemon slices and cook several minutes, until the lemon gets soft. Add the capers, lemon juice and white wine and cook until it’s thickened a bit. Remove from heat and stir in butter until well combined. Pour into a bowl and cover with foil. Heat remaining 1 Tbsp. olive oil in the skillet. When shimmering, add zucchini noodles and cook a few minutes, tossing occasionally, until they’re al dente. Sprinkle cooked noodles with salt. Serve the noodles topped with a chicken breast topped with the sauce. My mother-in-law gave me a veggie spiralizer for my birthday in June and up until now, it’s been sitting it the cabinet unused. Why? I knew spiralized veggies in place of spaghetti would be a hard sell at our dinner table. My husband grew up in a very Italian family and the man likes his pasta. To be honest, I wasn’t so sure about zucchini instead of spaghetti in a big, Italian meal either. But in a stir fry? That was something I could get on board with. I’m not a complete zoodle convert. You’re not going to mistake them for noodles in this dish but they’re good in their own right. I thought this was a great, lighter meal – and my husband downed several bites before asking me where the noodles were, always a good sign! 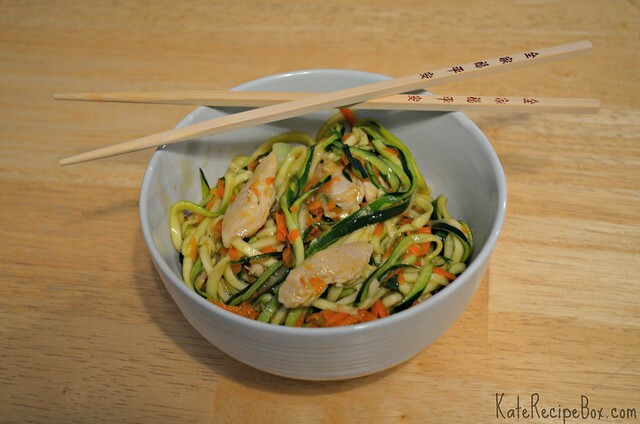 It’s probably a gateway dish for us – after this, I’ll definitely be trying more zoodle meals. In a small bowl, whisk together the broth, soy sauce, oyster sauce, rice wine and cornstarch until smooth. Set aside. Spiralize the zucchini and cut into spaghetti-length strips. Heat a skillet or wok on high heat. Add 1 tsp. oil. Season chicken with salt, add to the wok and stir-fry until browned and cooked through, about 3 minutes. Remove from wok and set aside. Add remaining oil to the wok, followed by the bok choy, carrots, scallions, ginger and garlic Cook for another 3 minutes. Remove from wok and set aside with the chicken. Pour the sauce mixture into the wok and cook for about a minute, until bubbling. Add the zucchini and cook until tender, about 2 minutes. Return the chicken and vegetables to the wok and toss to combine. Serve immediately.